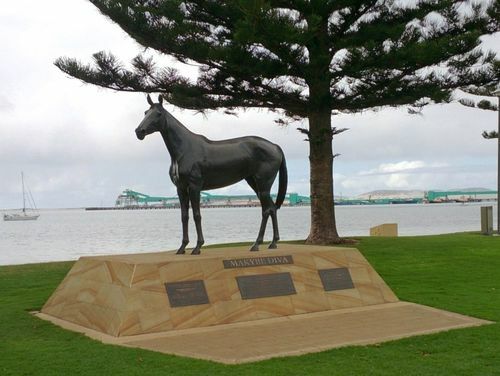 A statue commemorates Melbourne Cup winner, Makybe Diva who won the Melbourne Cup on three occasions. The life-size statue was unveiled in the home town of her owner Tony Santic. Makybe Diva is a British-bred, Australian-trained Thoroughbred that became the first racehorse to win the famed Melbourne Cup on three occasions: 2003, 2004, and 2005. In 2005, she also won the Cox Plate. Makybe Diva is the highest stakes-earner in Australasian horse racing history, with winnings of more than A$14 million when she retired on 1 November 2005. Makybe Diva is one of only five horses to have won the Cup more than once in the long history of the event, which was first run in 1861.